I’ve spent the last couple of days exploring WildCam Gorongosa data looking for insights into the Gorongosa aardvarks. I was motivated by numerous comments in Wildcam Talk about how rare aardvark sightings are. I started with the Wildcam Lab as an Explorer. The Lab houses a downloadable database of over 40,000 classified trail cam images. The download data includes links to the images and date, time, location, and other classification data. The image downloads can be filtered by many characteristics like species, habitat, seasons, etc. The downloaded data is in .csv format and can be processed by many programs like Microsoft Excel. Then I added to the download worksheet the images before and after those in the lab and search data. I used Nor’s widget ( http://njstargazer.org/gorongosa.asp) to move through the image sequences to include all the images that contained Aardvarks. I ended up with only 126 images over the 3 years. Not many! Those 126 images were from only 27 unique sightings or sequences based on the date and time stamps. All were of single individuals foraging at night. That likely means there are less than 27 total Aardvarks in the area monitored by these cameras! No young appeared in the images. Only 10 cameras had images of Aardvarks. I divided them into three geographic areas: Southwest – C06, C08 & D10; Southcentral – C15, D14, D35, D61 & D73; and Northeast – D56 &D57. There was a significant shift in sightings in these areas from 2013 to 2014 (only two sightings in 2015 so I excluded them). There was roughly a 25% increase in sightings in 2014 (14) from 2013 (11) but there were only two sightings in 2015? In 2013, there were five sightings in the Southwest and six in the Southcentral and none in the Northeast. In 2014 that changed. There was only one sighting in the Southwest and four sightings in the Southcentral and remarkably nine unique sightings in the Northeast. Of course, there could be many explanations for this including when the cameras were running and where as well as many other factors. I also looked at the sightings by season. There are twice as many (16) in the Dry (July – Sep) season as there are in the transition to Wet (Oct – Dec) season. There were no sightings in the Wet (Jan-Mar) season and only three in the transition to Dry (Apr-Jun) season. Wildcam is such an amazing project that we lay persons can explore and learn to our hearts delight. I’m happy to share my Excel worksheet with any of you that would like to see and use it. Send me @LeeReiswig a message and I can email or put it in the cloud for access. Enjoy exploring Gorongosa with these wonderful tools! Wildlife populations in Gorongosa National Park in the Sofala Province of Mozambique are currently recovering from almost complete eradication after a long civil war. Antelope, baboons, and warthogs have come back in the thousands; elephant numbers are slowly growing, and even a small population of lions has returned. But everyone wonders: where are the leopards? With plenty of prey, suitable habitat and limited competition from more dominant predators (lions), they should be flourishing. So far, though, there has been no indication that they are in the Park. The question now is how to create and support viable corridors that support leopard recovery, as well as lion, wild dog and hyena. Neighboring concessions have reported all these species. And as for leopard specifically, an adjacent forestry as well as a hunting concession a few kilometers from the Park is one such area that has claimed presence of leopards. So the grand adventure begins! With the gracious donation of 25 new Bushnell cameras from the Howard Hughes Medical Institute and permission from the forestry concession manager we set out to investigate. ­Our colleagues organized a team of scouts to take us out to areas where large carnivores are frequently spotted. After over an hour’s drive on a bumpy road from the lodge through amazingly intact forests, we hefted our packs full of cameras and hiked down into a small gorge known to frequently be used by leopards. Almost immediately, the scouts spot a cat track. Too small for lion, it must be leopard. It was encouraging to detect their presence so early in our exploration. We ended up finding tracks all through the sandy gorge, some incredibly fresh, and it was clear that many different species were utilizing the river. It appeared the cats had been in the gorge almost staying just ahead of us as we walked. Needless to say, we blanketed the area with cameras, eager to find out what kinds of animal communities call this place home. The next day, we visited a more open area where kudu, zebra, and other large antelopes are though considered rare inside Gorongosa. The scouts have also spotted small lions and believed that wild dog could be inhabiting the area as well. With only one permanent water source, a few cameras next to wildlife trails leading to the drainage should capture most of the area’s mammals. Though, we did put one up high in a tree in an attempt to capture whatever animals might be using an old dirt road. Thankfully, these rangers are much better climbers than I. It was great working with the forestry scouts, and we both walked away with new skills. The information we gather from these cameras will help us better understand how much potential the area has for serving as a wildlife corridor into the park. Of course, habitat quality and the presence of apex predators are not the only factors that will enable a healthy park ecosystem. Recovery will depend largely on people. Unfortunately, a few snares were found along the way, but I am optimistic that a strong partnership between the park and the forestry concessions will continue to facilitate the recovery of Greater Gorongosa’s wildlife. The steps we took last week – the many bumpy road kilometers – are the first of many as we try to unravel the structure and function of corridors for large carnivores in Gorongosa-Marromeu. 25 minutes after we deployed this trail camera she passed by… a healthy lioness with 2 new cubs. 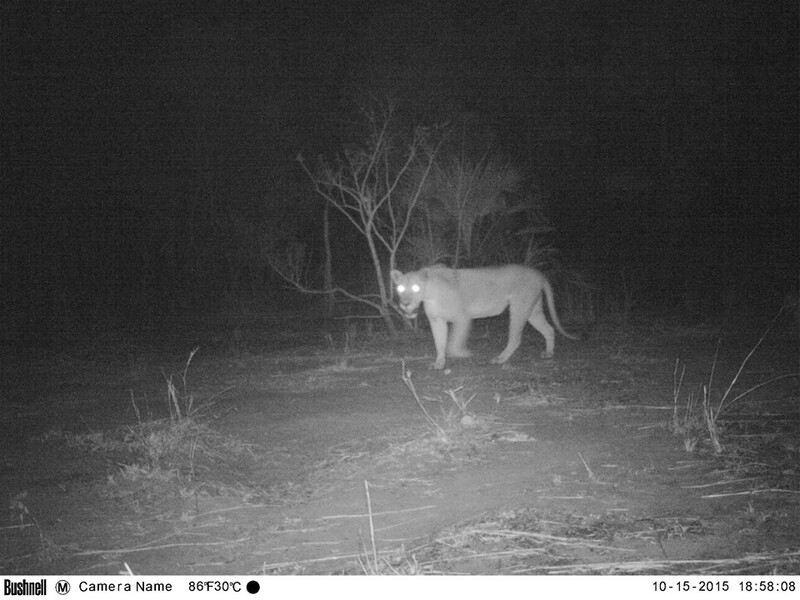 We are tracking them this week not far from Chitengo Camp (Gorongosa’s main tourist camp). We feel like we might as well be tracking a tiger as she is denning her cubs in and around the lush palm forests lining the beautiful Pungue River. Finding two new cubs on a trail camera is such a wonderful feeling. It means that the lions are breeding and, we hope, the lion population is growing.